"This programme changed my way of thinking. I have more potential than I conceive. I can go beyond the limits of my fear. I can go for Man v/s Wild! 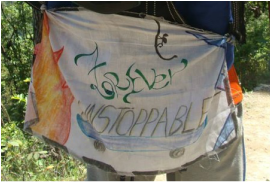 Impossible is nothing." -Sanawar Boys, Class 11. "friendship is very important in the wild." "how fast people can co operate when it is challenging." "how important it is to make a fire safely." "I thought I was stronger than I am." "I can live without electricity." -Stonehill students. 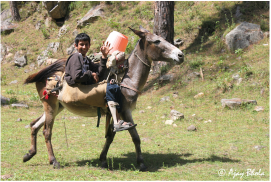 "The trekking and rafting expeditions were able to expand and push my limits of mental will power." "The program was really challenging as it made us deal with meeting new people and overcome social barriers, it allowed me to make new friends and think about the way I act around new people." "I learnt how important it is to listen to the people around me. It helped us develop as a team." "Even when things get difficult I now know I can make it through and achieve something great!" ﻿Tara Homes, New Delhi. 15 - 30 May 2014. ﻿These children were going out of the city for the first time. 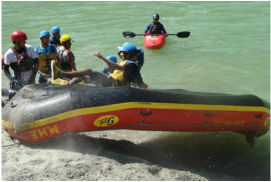 They spent 2 weeks at the HOB Tons summer camp, rafting, trekking, climbing, rapelling. Learning how to live in the wilderness and respect it. 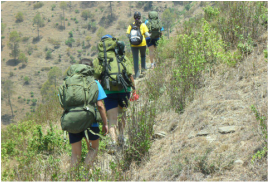 One young person who thought he would not be able to trek due to a game leg, also managed it all as you see in the photographs. It was an amazing high for him. These children came back with 'our eyes opened to so many new things'! The Lawrence School, Sanawar. Himachal Pradesh. 29 April - 3 May 2014. The boys from Class 11 came for an Outward Bound Ganga river expedition for the first time, they met the challenges of the river with great intrepidity, their main challenge was setting camp and cooking for themselves - they did it and enjoyed it too! IAYP Gold Adventurous journey that took them on a great trek in the Tons river valley. Learning to navigate old style, counting footsteps and marking way points, compass readings, totally self contained expedition where the girls took complete ownership and learned that they could do it all. Explorer Programme at the Satpura National Park. Madhya Pradesh. Jeep, elephant and walking safaris, learning about animal habitats, forestry, conservation and sericulture. This is one of the only National Parks where walking safaris are possible, a great opportunity to learn about tracking and finding animal signs. 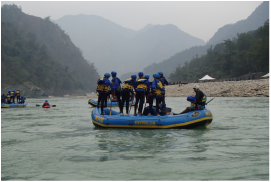 An 'Explorer' Ganga Raft Expedition. A 4 day programme of wilderness and adventure. Learning to make raft shelters, cook their meals, deal with bad weather, navigate rafts, learn about the river and have a heap of fun with friends. 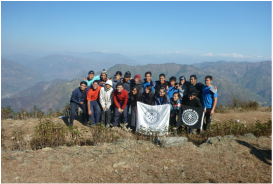 An 'Explorer Plus' trekking programme in the Dharamsala area, that encountered great adventure with weather, had to move, resettle, trekked up into snows and discovered huge insights into their abilities and adaptability. A programme run at Orccha to help build leadership skills and knowledge for senior boys getting ready to go out into the world. 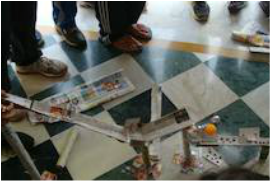 British School New Delhi, Grade IV, 13th & 14th Feb 2014. 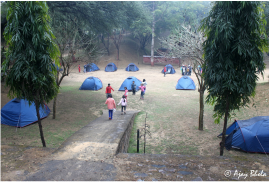 A 'Discovery' programme for little people to initiate them into living under canvas, basic camp skills, co habiting and discovering team work. The programme was run at Damdama in Haryana. A winter trek in the Dhauladhar mountains around Dharamsala. They wanted challenge, ownership and local interaction. They got to navigate themselves, find and set up their campsites, cook and totally take care of all aspects of their trip. ﻿Outwar﻿d Bound Singapore 14th-24th November and 27th-7th December. 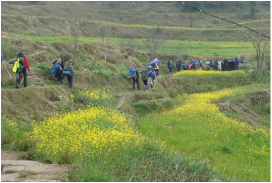 This challenging 10 day program took students aged 16-19 from Singapore on both a self efficient trekking expedition in Uttarakhand enabling them to see the high Himalayan mountain range and a rafting expedition down the holy Ganga. Click here to find out more. CCA School and Badal Shcool 5th-9th November. 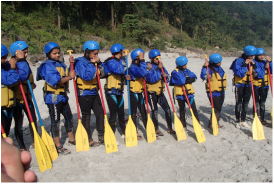 The first of it's kind for Himalayan Outward Bound took a rural school from Shivpuri and mixed them together with a city school from Delhi on a 3 day rafting expedition down the Ganga. Allowing cultural barriers to be broken and new friends to be made. British School, Delhi 12th-15th November. 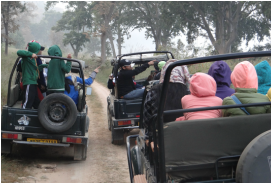 Held in the beautiful Panna National park at Ken River Lodge this program took a group of year 6 students on a daily safari in search of all that the jungle offers! They also took part in a ropes course, community project and made rafts to paddle across the Ken River. Click here to find out more. 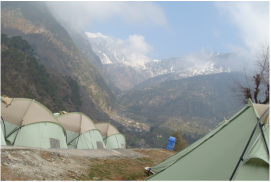 High in Himachal Pradesh this program allowed the group to trek in the valleys surrounding the small village of Sali, Dharamshala. Setting up there campsite each night in beautiful mountain scenery. We also visited the town Of McLoedganj seeing a community of Tibetans living in exile. Click here to find out more.